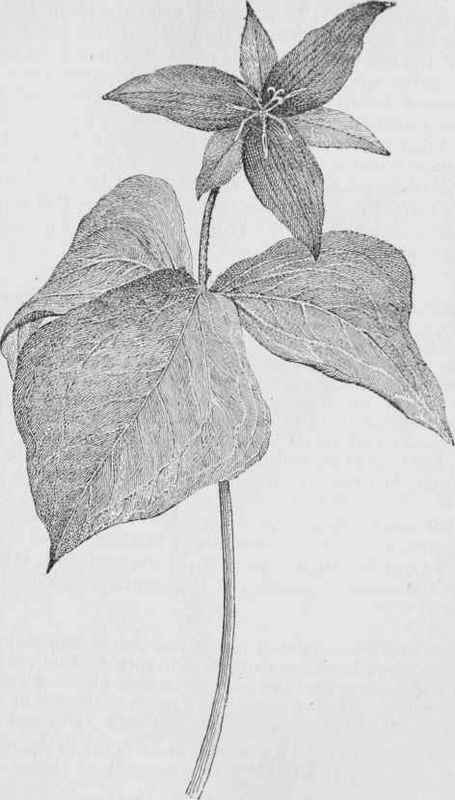 Trillium erecfum - Family, Lily. Color, variable. It is called all shades of purple, crimson, pink, white, or greenish. Perhaps the more common color is deep pink. Sepals, 3, narrower than the 3 petals, remaining after the petals have withered. Anthers of the 6 stamens long, on short filaments. The pistil bears 3 stiff, spreading stigmas which are stigmatic on their inner side. The solitary flower stands or droops on a peduncle 1 to 4 inches long. Flower 2 to 3 inches across. Leaves, 3, above on the stem, very broad, 3 to 6 inches long, rhombic in shape, very sharply acute at apex, sessile. April to June.